PC World purchased seven hard drives, seven memory modules, and ten cell phone batteries online, using pricing search engines to find low prices. We then asked vendors to authenticate the gear. Of the two dozen products we bought, four (all cell phone batteries) were counterfeit - Nokia, Motorola, and Kyocera. 40% of the cell phone batteries purchased online in the US turned out to be fake! At least Nokia had provided a method for consumers to check authenticity. They included a hologram and unique serial number under a scratch off panel. The counterfeiters spoofed the hologram but didn't bother with the code - images here. Regardless of where a fake comes from, you probably won't know it's bogus until you try to get the nominal maker to service it. 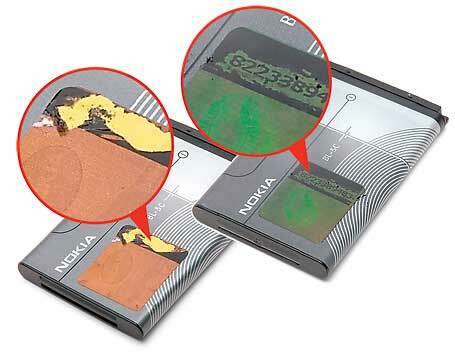 Nokia is unusual in providing its customers a way to check the authenticity of their products. This powerful tool is what YottaMark provides brand owners.